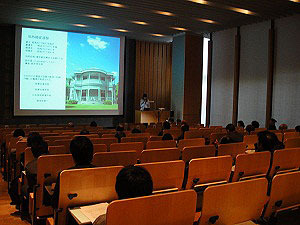 On February 10th, the Center for Conservation Science and Restoration Techniques hosted a study meeting on “Use of Oil-based Paints in Modern Architecture in Japan” in the Institute’s basement seminar hall. 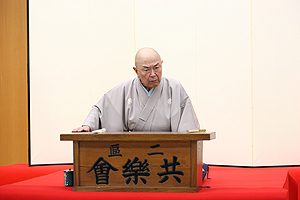 Oil-based paints were used in modern buildings from Meiji to Showa period. In recent attempts to restore these buildings, a frequently encountered problem has been the difficulty of identifying materials in paints. Even if they are identified, the original paints are often hard to obtain, so other materials have to be employed to repaint. Under this situation, specialists from the Agency for Cultural Affairs, museums – from both curatorial and science sections –, and a private company, met to discuss how the modern buildings, i.e. current cultural properties, were painted at that time, how those paints can be identified, why oil-based paints are hard to obtain now, and the steps that can be taken to solve these problems. 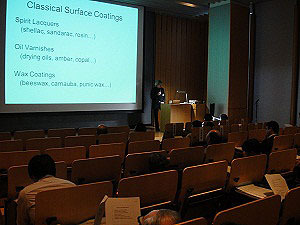 Presentations were made concerning techniques to identify materials in paint samples and the difficulties in oil-based paints includes the historical background that they became obsolete because of their slow drying property. 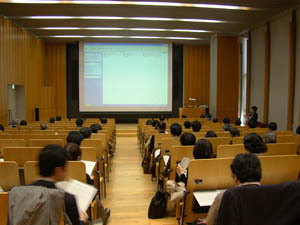 The speakers were actively engaged by the audience of 45, making the study meeting a meaningful one. 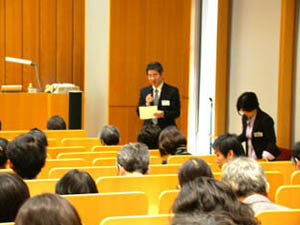 The Japan Center for International Cooperation in Conservation plans to undertake a four-year training program from 2011 to 2014. Under this program, a series of workshops covering documentation, excavations, conservation, and site management will be held in the medieval fortified town of Ak Besim in the Chuy Valley, Kyrgyz Republic. This program has been commissioned by the Agency for Cultural Affairs, Japan and aims to train young experts in Central Asian countries in the protection of cultural heritage in Central Asia. 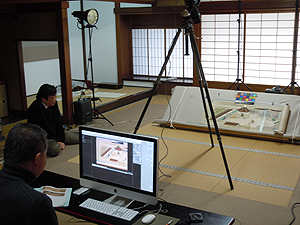 This year, two workshops on the documentation of cultural heritage were planned. The first workshop, which covered archaeological surveys, was conducted last October. 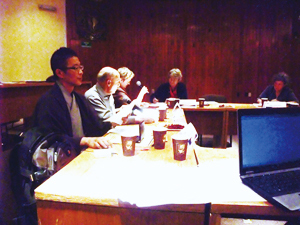 The second workshop was held at the Institute of History and Cultural Heritage, National Academy of Sciences, Kyrgyz Republic from February 4 to 10, 2012. 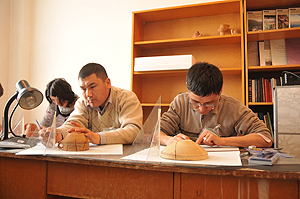 A total of eight Kyrgyz trainees participated in the workshop and keenly studied archaeological objects such as pottery, stone tools, and clay figurines. 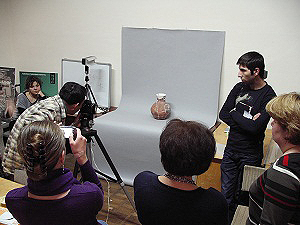 They also practiced rubbing techniques and photography and they visited a traditional pottery workshop in Bishkek to study pottery production. Such workshops should help to protect cultural heritage in Central Asia in the future. 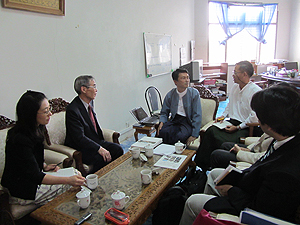 The Japan Consortium for International Cooperation in Cultural Heritage surveyed the cultural heritage of Myanmar from February 22nd to the 28th. The main goal of the survey was to explore current and future developments in international cooperation to preserve cultural heritage in Myanmar by visiting sites firsthand and determining Myanmar’s specific requirements for cooperative efforts. Sites such as temples in Bagan and wooden structures in Mandalay were visited along with museums and libraries. Survey members gathered information and interviewed relevant personnel. 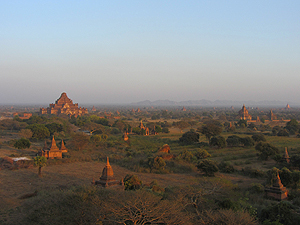 Results of the survey indicated that cultural heritage sites in Myanmar are deteriorating overall. Systems for protection are inadequate, and heritage sites are in danger. Tourists to Bagan have increased sharply from last year, and the current tourism infrastructure is reaching the limits of its capacity. In addition to site protection, sustainable development is also a problem given urban conditions and disparities in income levels. In addition, museums have a serious lack of conservation and research facilities. In line with changes in Myanmar in recent yearst, the country will need even more support from Japan and the rest of the international community in every area, including the protection of cultural heritage. Such support projects will need to be coordinated in the future. Plans are to extensively discuss the future forms of Japan’s cooperation to preserve cultural heritage with relevant institutions.